Shhh… no one ever has to know they’re vegan. It’s Thanksgiving crunch time. You may already have the turkey in a brine, the day-old bread for your stuffing, and a few bags of cranberries in the fridge. But have you remembered something green? This is no time for kale—Brussels sprouts are the must-have vegetable of the season. When prepared properly, they turn out tender, and as sweet as onions. This simple recipe, which cleverly combines maple syrup and red miso, comes to us courtesy of Cafe Gratitude’s executive chef Dreux Ellis. Pick up a few fresh sprouted stalks from your favorite market and serve them alongside a bowl of fluffy mashed potatoes, a hearty squash salad, and your favorite pie. And then, over an overflowing table, gaze upon your loved ones and give thanks. In a blender, combine the olive oil, maple syrup, red miso, tamari, and apple cider vinegar. 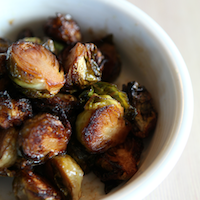 Dress the Brussels sprouts liberally with the glaze. Make sure the Brussels are well-coated and lay out on a baking tray. Drizzle 1/4 cup of water over the Brussels sprouts to add some vapor while cooking. Bake at 325 degrees for 20 minutes or until well-cooked and caramelized. Approximately 10 minutes into the cooking time, turn the vegetables to ensure even cooking.